About Us - Woodpecker Holidays, Pothamedu, Munnar - Operated By Group Farming Corporation India Ltd. The Resort is situated in the midst of skyscraping trees. One can get a soothing sight of cardamom plantations which beckons a forest preview and makes the holiday an unforgettable place. A pond aside makes the holiday really a memorable one and nameworthy as 'God's own place' where nature mergers its beauty at its best. WOODPECKER RESORT is run by Group Farming Corporation India Limited is an ISO – 9001:2008 Company Registered under the Companies Act 1956. Our Registered office is located at Ravipuram, Kochi, Kerala. We are promoting ecotourism that is travel to natural areas that conserves the environment and improves the well-being of the local people. Ecotourism promotes greater understanding and appreciation for nature, local society and culture. Ecotourism is uniting conservation , communities and sustainable travel . We promote Responsible Tourism that operates in such a way as to minimize negative impacts on the environment. We are providing 3 star facilities to our guests in Woodpecker Resort’. Woodpecker Resort is situated in the midst of skyscraping trees. It is the best and ideal holiday destination. One can get a soothing sight of cardamom plantations which gives out a forest preview and makes the holiday an unforgettable place. A pond aside makes the holiday really a memorable one and nameworthy as 'God's own place' where nature mergers its beauty at its best. A Hill-view sight is also there which makes the trip an outstanding one. The castle-type appearance of the resort gives out a homely atmosphere. This is the ideal tourist destination in Pothamedu. 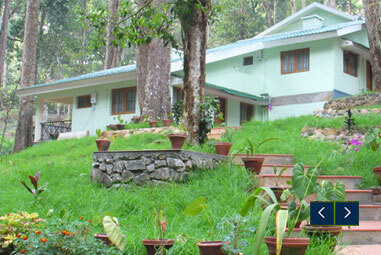 Guests are provided with cottage style accommodation at the woodpecker Munnar. The cottages have single and double bed occupancy. The cottages have beautiful and stylishly decorated interiors. The cottages are equipped with all modern amenities that are required for a hassle free stay. These cottages have balcony overlooking evergreen trees and giving a soothing effect of a dense forest. The night over-view from the balcony gives out a soothing effect. One can feel the charming and attractive beauty of the nature with its originality. They feel themselves in the bewilderness of the thick forest and gives out a everlasting memory in the tourists mind. The hill resort of Munnar, experiences cool weather all through the year. In the summer months you will need to carry some light woolens for protection against the chill. Whereas in winters, you should be, completely covered in woolens. The temperature drops down to as low as five degree Celsius. Woodpecker at Pothamedu is one of the breathtaking beauties of The Sahya Mountain Ranges (The Western Ghats). This is also a haven of peace and tranquility - the idyllic tourist destination in God's own country. It is the most sought after tourist destination of South India. The Nature’s walk through the midst of tea plantations is really heart-throbing. The combination of Munnar’s refreshing climate, its High Range hilltops and luxuriant spice and tea gardens makes it an exceptional holiday destination. You can also buy original farm spices fom the estates nearby and taste the real splendour. It is a nature-friendly cottage which has its keen bond with nature. The Flora and Fauna found nearby is mind-warming with the added attraction of chirpings of different attractive birds. Greetings and warm welcome to Woodpecker Resort, Munnar! First of all, I thank you for choosing Woodpecker Resort.